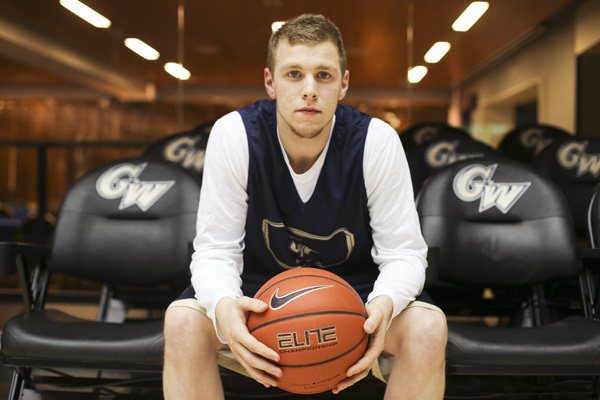 Freshman Paul Jorgensen has emerged as GW's seventh man and scored a career-high 13 points against Duquesne on Saturday. It was May 2013, and a lesser-known high school junior with shaggy blond hair and devastating dribbling was taking his skills to a group of New York City’s finest high school ballers on a court at 145th Street and Lenox Avenue. He was Paul Jorgensen, a product of Don Bosco Preparatory High School, scoring seven baskets in a row to earn the nicknames “The Prince Harry of Harlem” and “White Jesus” for his moves playing one-on-one street ball on the courts of New York City, where legends like Kareem Abdul-Jabbar and Julius Erving honed their skills. Head coach Mike Lonergan had previously coached another point guard from Don Bosco and he kept in touch with Jorgensen’s coach, who reached out to say that he thought his star was flying under the radar, mostly getting notice from Catholic League schools. The heads up and some help from two former players – brothers from Jorgensen’s hometown of New City, N.Y. – gave Lonergan an in. So Jorgensen traded high school stardom in New Jersey and street-ball fame in New York for the DMV, sausage-egg-and-cheese GW Deli sandwiches (on plain bagels, Jorgensen said), and the discipline and patience of a competitive program in a college-hoops hotbed. Though he’s looking forward, Jorgensen took a visit back to the Empire State on Thursday, when the Colonials took on Fordham in the Bronx. Jorgensen played 13 minutes, scoring four points and adding two rebounds and two assists. In his return to D.C. on Saturday, Jorgensen tallied a career-high 13 points in GW’s win over Duquesne, sinking two threes and hitting a handful of acrobatic layups. His playing time has grown since back in November, when he rarely saw the court. Jorgensen has earned his way into the rotation as the “seventh man,” Lonergan said, with his exceptional dribbling skills and active defense. Jorgensen wouldn’t mind the spotlight that comes with a larger role. He’s a basketball maniac who gets frustrated by time off and is at his best when taking on bigger, supposedly better players on a big stage. His favorite moment as a Colonial, he said, was beating No. 11 Wichita State to win the Diamond Head Classic in Hawaii. “I love those kind of situations. I love when people are watching and when we’re playing the better teams,” Jorgensen said. People are certainly watching, and Jorgensen could be forced into a greater role with classmates Yuta Watanabe and Darian Bryant suffering injuries – an ankle sprain for Watanabe and a concussion for Bryant. Jorgensen’s success will likely depend on how he makes decisions on the court and Lonergan’s ability to break him in to get the most out of the freshman’s energy. The tenacious point guard is looking to make a name for himself in D.C. after a standout career at Don Bosco Preparatory High School in Ramsey, N.J.
Jorgensen has been shuffled around the court a bit, playing some minutes at shooting guard, but he’s mostly been tagged as the backup to junior point guard Joe McDonald, another player who is known for coming through when under pressure. Jorgensen and McDonald are different players: McDonald is stockier, bullish and a plotting rebounder, while Jorgensen is an in-your-face, quick-off-the-dribble, whirling dervish on the court. But there’s also a zen aspect to the feisty guard. Jorgensen’s favorite class is peace studies, he loves to walk around the monuments to “regroup” and he’s an avid yogi. Of course, the rookie’s peaceful state of mind has its lapses. 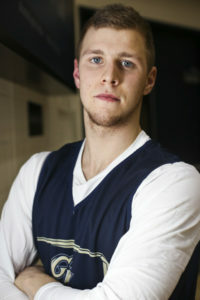 Jorgensen can be impulsive on the court: He committed four turnovers in the last five minutes of the Duquesne game. He also admitted that he’s likely to be found in the steam showers after a junk food binge, sweating it out. In other words, he’s still a college freshman. Jorgensen said he wants students to know that he’s “just an approachable guy,” but Lonergan said he sees more significance in the boisterous personality.